This article is about the football club. For the women's football club, see Watford L.F.C. England manager Graham Taylor's tenure at the club saw Watford scale new heights. Between Taylor's appointment in 1977 and departure in 1987, Watford rose from the Fourth Division to the First Division. The team finished second in the First Division in the 1982–83 season, competed in the UEFA Cup in 1983–84, and also reached the 1984 FA Cup Final. Watford experienced a decade of decline between 1987 and 1997, before Taylor returned as full-time manager, leading the team to successive promotions from the renamed Second Division[a] to the Premier League for one season in 1999–2000. The club experienced a further one season stint in the top division of English football during the 2006–07 season, under Aidy Boothroyd's management; eight years in the Championship followed. Watford secured promotion in 2014–15, and have competed in the Premier League since the 2015–16 season finishing 13th, 17th and 14th respectively. Watford is owned by the Pozzo family, which also owns Udinese Calcio in Italy and previously Granada CF in Spain. Sir Elton John, who owned Watford during both of Graham Taylor's successful periods as manager, served alongside Taylor as the club's joint Honorary Life President until 2008, only to later resume the role he shared alongside Graham Taylor until Taylor's death. When three-parts of the season was gone, there were whispers of the advantages of amalgamation of the two clubs. That the principle was right few disputed, and the question narrowed itself down to a few minor difficulties. It was ascertained that the executive on both sides regarded the suggestion favourably, and joint meetings of the officials were arranged. The proposals took a definite shape, and very soon amalgamation was a thing accomplished. It was decided, however, that each club should finish off its fixtures. Next season the Watford club will play on the Cassio-Road ground, and one of the chief ideas of the amalgamation is to have a second team of sufficient strength to be an attraction while the first string is engaged elsewhere. The details of the amalgamation scheme we have already given in these columns. Generally speaking, then, the local football season which has just closed has been a most important one. It has witnessed two steps which have marked fresh epochs - the adoption of professionalism and the amalgamation of West Herts and Watford St. Mary's. The amalgamation was approved by the full F.A. committee on 27 May 1898 as reported by the Lichfield Mercury of 28 May 1898 "permission was given to Watford St. Mary's and West Herts to take the name of Watford Football Club, the two clubs having amalgamated." West Herts were previously known as Watford Rovers who were formed in 1881 by Henry Grover, who went on to play for the club as a full back. Rovers, originally composed entirely of amateur players, held home games at several locations in the town of Watford. The team first competed in the FA Cup in the 1886–87 season, and in 1889 Watford won the County Cup for the first time. The team became the football section of "West Hertfordshire Club and Ground" in 1891, and consequently moved to a ground on Cassio Road. As "West Herts" they joined the Southern Football League in 1896. West Herts fortunes slumped at the start of the 1897/98 season and attendances were less than 200. They took the bold step of turning professional and their fortunes revived. Watford St. Mary's were runners up in the Hertfordshire Senior Cup of 1894/95 and attracted crowds of 400 to 500 even when West Herts were at home. The two clubs talked of an amalgamation, which ultimately occurred on 15 April 1898. This was reported by the Watford Observer of 7 May 1898. It was agreed that the two clubs should complete their remaining fixtures for the season. The new club was named Watford Football Club. Long-serving Skilly Williams was Watford's first choice goalkeeper between 1914 and 1926. Following relegation to the Southern League Second Division in 1903, Watford appointed its first manager – former England international and First Division top scorer John Goodall. He led Watford to promotion, and kept the team in the division until his departure in 1910. Despite financial constraints, Watford won the Southern League title in the 1914–15 season under his successor, Harry Kent. Watford held the title for five years following the suspension of the Southern League during the First World War – after finishing the 1919–20 season runners-up on goal average, the club resigned from the Southern League to join the new Football League Third Division. From 1921–22, the third tier of The Football League consisted of two parallel sections of 22 clubs, fighting both for promotion to the Second Division and also battling to hold on to their league status. There was a re-election system in place which meant the bottom two teams in each of the two divisions had to apply for re-election to the league. Watford finished outside the top six league positions in every season between 1922 and 1934. Following Kent's departure in 1926, they finished 21st out of 22 clubs in 1926–27, but were unanimously re-elected to the league after a ballot of clubs in the top two divisions of The Football League. By contrast, under Neil McBain and subsequently Bill Findlay, the team recorded five consecutive top six finishes between 1934–35 and 1938–39, and won the Football League Third Division South Cup in 1937. The Football League was suspended in 1939 due to the Second World War. Chart of yearly table positions of Watford in the English football league. Football resumed in 1946, with Watford still in the Third Division South. A 23rd-placed finish in 1950–51 meant that the club had to apply for re-election to the league once more, but again teams in the First and Second Divisions unanimously voted for Watford to stay in the league. McBain returned in 1956, and the team remained in the division until 1958; the league was restructured into four national divisions for the 1958–59 season, and Watford were placed in the Fourth Division. Ron Burgess replaced McBain during that season, and in the following campaign Burgess presided over Watford's first Football League promotion. This team included Fourth Division top scorer Cliff Holton, who scored a club record 42 league goals in the season. Holton was sold to Northampton the following year after another 34 goals, to the anger of supporters. Burgess was succeeded by Bill McGarry, who bought new players such as Charlie Livesey and Ron Saunders, and in his only season at the club led the club to what was at the time its highest ever league position: third in the Third Division. Eighteen-year-old Northern Irish goalkeeper Pat Jennings also featured under McGarry, and made his international debut despite being a Third Division player. McGarry joined Ipswich in 1964, and was replaced by player-manager Ken Furphy, from Workington Furphy rebuilt the team around players such as Keith Eddy and Dennis Bond, but after holding Liverpool to a draw in the FA Cup and narrowly failing to win promotion in 1966–67, Bond was sold to Tottenham Hotspur for £30,000, Watford's record transfer receipt at the time. Furphy's rebuilding came to fruition in 1969 with the signing of Barry Endean, whose arrival marked the start of an unbeaten run after Christmas. Watford secured the Third Division title in April, at home to Plymouth Argyle. A year later Watford reached the FA Cup semi-final for the first time, defeating First Division teams Stoke City and Liverpool along the way. Hampered by a lack of funds, however, Furphy eventually joined Blackburn Rovers, to be succeeded by George Kirby. Forced to sell players to survive, Watford fell back into the Third Division in 1972. The team continued to struggle in the third tier, and despite a managerial change, Watford were relegated again in 1975. Watford's starting line-up for the 1984 FA Cup Final. Paul Atkinson came on as a substitute; Graham Taylor managed the team. Lifelong Watford supporter Elton John became club chairman in 1976. The singer declared an ambition to take the team into the First Division, and sacked Kirby's successor Mike Keen in April 1977. When Graham Taylor was named as Keen's successor, the club was still in the Fourth Division. Taylor achieved promotion in his first season; Watford won the Fourth Division title, recording the most wins, fewest defeats, most goals scored and fewest goals conceded of any side in the division. Promotion to the Second Division followed in 1978–79, and Ross Jenkins finished the season as the league's top scorer with 29 goals. Watford consolidated with 18th and 9th-placed finishes over the following two seasons, and secured promotion to the First Division for the first time in 1981–82, finishing second behind rivals Luton Town. Watford started the 1982–83 season with four league wins from the opening five fixtures; in the space of seven years, the club had climbed from bottom place in the lowest division of The Football League to top position in the highest division. Watford were unable to maintain a title challenge, but eventually finished the season second behind Liverpool, which ensured UEFA Cup qualification for the following season. Luther Blissett finished the season as the First Division top scorer, before signing for Italian Serie A side Milan for £1 million at the end of the season. An FA Cup Final appearance followed in the 1984 fixture, where they lost to Everton. After guiding Watford to a ninth-place finish in 1986–87, Taylor left the club to manage Aston Villa. Following Taylor's departure, Wimbledon manager Dave Bassett was appointed as his replacement, and England winger John Barnes was sold to Liverpool. After 4 wins from his opening 23 league fixtures, Bassett was sacked in January 1988. Watford were bottom of the First Division at the time of his departure, and Steve Harrison could not prevent relegation at the end of the season. In 1988–89, Harrison's Watford failed to return to the First Division, after defeat in the Second Division play-offs. The under-18 team won the FA Youth Cup, beating Manchester City 2–1 after extra time, with future England international David James in goal for the Hornets. Harrison departed in 1990, and over the next few years, the closest Watford came to promotion was a seventh-placed finish in Division One[b] in the 1994–95 season. However, in the following season – Glenn Roeder's third as manager – Watford struggled. Despite the return of Graham Taylor as caretaker manager in February 1996, the club was relegated to Division Two. Following the relegation, Taylor became Director of Football, with former Watford midfielder Kenny Jackett as manager. After a mid-table finish in Division Two in 1996–97, Jackett was demoted to the position of assistant manager. Taylor returned as manager, and won the Second Division title in 1997–98 – Watford's second league title under his management. A second successive promotion followed in 1998–99, thanks to a 2–0 play-off final victory over Bolton Wanderers. Watford's first Premiership season started with an early victory over Liverpool, but Watford's form soon faded, and the club was relegated after finishing bottom. Graham Taylor retired at the end of the 2000–01 season, and was replaced by Gianluca Vialli. Wage bills at the club rose by £4 million during Vialli's tenure, and the club finished 14th in the division in 2001–02. Vialli was sacked at the end of the season, following a dispute with the club's board over the wage bill. He was replaced by Ray Lewington, who had joined the club the previous summer as Vialli's reserve team manager. 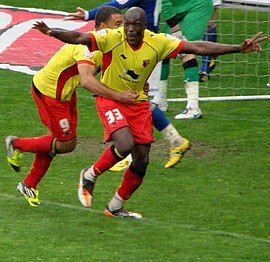 Nyron Nosworthy celebrates a goal against Cardiff City in the 2011–12 season. Watford's weak financial position was exposed in 2002–03, following the collapse of ITV Digital. The club was facing administration, but an agreement by players and staff to a 12% wage deferral helped the club's cash flow, and a run to the FA Cup semi-final generated vital revenue. Financial constraints saw a large number of players released that summer. After consolidating in 2003–04, the following season started well, with the club in the upper half of the Championship at the end of September. Poor form, however, saw the club drop towards the relegation zone. Despite reaching the semi-final of the League Cup, Watford's league form did not improve, and Lewington was sacked in March 2005. His successor, Aidy Boothroyd, led the club to Championship survival. Watford finished third in the league in Boothroyd's first full season, and defeated Leeds United 3–0 in the play-off final to gain promotion to the Premier League. But the team did not record a Premier League win until November, and Ashley Young was sold to Aston Villa for a club record fee of £9.65 million in January 2007. Watford finished bottom after only winning five league games, but did reach the semi-finals of the FA Cup. Boothroyd continued as manager, and spent heavily on players, including a then-club record £3.25 million for Nathan Ellington. Watford led the Championship by several points early in 2007–08, but only finished sixth; Boothroyd's team were defeated 6–1 on aggregate by Hull City in the play-off semi-finals. Boothroyd left the club by mutual consent three months into the 2008–09 season, with Watford 21st in the Championship table. Under Boothroyd's successor, Brendan Rodgers, Watford finished 13th. Rodgers left to manage Reading at the end of the season; Malky Mackay, who had previously served as caretaker manager, was his replacement. Amid the departures of several key players during Mackay's tenure, including Tommy Smith and Jay DeMerit, and the club coming close to administration, Watford finished 16th in 2009–10 and 14th the following season. Mackay left to manage Cardiff City in June 2011 and was replaced by Sean Dyche. Despite presiding over Watford's highest league position in four years, Dyche was dismissed as Watford manager in July 2012. He was replaced by former Italy international Gianfranco Zola following the Pozzo family's purchase of the club. Dyche went on to achieve success with Burnley and become one of their longest serving football managers. In the 2012–13 season Watford finished third in the Championship, and reached the play-off final where they were defeated in the final by Crystal Palace 1–0 via an extra-time penalty by Kevin Phillips. The following season, Giuseppe Sannino replaced Zola, as their new manager and the team finished the season in 13th place. Sannino resigned at the start of the 2014–15 season and was replaced by Óscar García, who left shortly afterwards for "health reasons." Billy McKinlay replaced him and won his first game in charge, 2-1 against Brentford F.C., before a 1-1 draw with Brighton & Hove Albion F.C.. Despite the team getting 4 points out of a possible 6 under his stewardship, the club decided to replace McKinlay, just eight days into his tenure, with Slaviša Jokanović. With Jokanović managing the team, Watford, on 25 April 2015, gained promotion to the Premier League after defeating Brighton 2–0 and other results going their way. However, they failed to win their final game of the season against Sheffield Wednesday, thus allowing AFC Bournemouth to win the Championship title in the season's finale. Jokanović and Watford did not renew his one-year contract and the manager was replaced in June 2015 by the Spaniard Quique Sánchez Flores. Watford's first fixture in their return to the Premier League was a 2–2 away draw with Everton. In the 2015–16 season, Watford reached the semi-finals of the FA Cup with a goal by midfielder Adlène Guedioura against Arsenal at Emirates Stadium, ending Arsenal's bid to win the competition for three successive times, and finished 13th in the Premier League. Near the end of the season, in May 2016, Sánchez Flores and the club enacted a break clause in his contract, because, as he stated, he and the owners "[did] not have the same point of view about the season," and was replaced by Italian coach Walter Mazzarri who signed a three-year contract. At the end of the next season, in May 2017, Watford finished 17th and Mazzari resigned, replaced by Marco Silva. The new coach was sacked after approximately six months, in January 2018, and the club hired Javi Gracia. Since then, he has subsequently been rewarded with a new contract running until 2023 following the good form of the Watford side during the 2018/19 season. In April 2019 Watford came back from 2-0 to beat Wolverhampton Wanderers F.C. to reach the FA Cup Final with Delofeau scoring twice and Troy Deeney scoring in the 95th minute taking it to extra time. Watford's colours were blue and white from 1927 until 1959. The club changed to a gold and black colour scheme in 1959–60. Watford's kit has changed considerably over the course of the club's history. The club's kit featured various combinations of red, green and yellow stripes, before a new colour scheme of black and white was adopted for the 1909–10 season. These colours were retained until the 1920s, when the club introduced an all-blue shirt. After a change of colours to gold shirts and black shorts for 1959–60, the team's nickname was changed to The Hornets, after a popular vote via the supporters club. These colours remained until 1976, when Watford's kits started featuring red, and the gold was changed to yellow. That colour scheme has continued into the 21st century. Watford's initial nickname was The Brewers, in reference to the Benskins Brewery, which owned the freehold of Vicarage Road. This nickname did not prove particularly popular, and upon the adoption of a blue-and-white colour scheme in the 1920s, the club became predominantly known as The Blues. When Watford changed kit colours in 1959, supporters chose The Hornets as the team's new nickname, and the club later introduced a crest depicting a hornet. In 1974 the design was changed to depict Harry the Hornet, the club's mascot. The club's nickname remains, but in 1978 the hornet crest was replaced by a depiction of a hart – a male red fallow deer– on a yellow and black background. A hart represents the town's location in the county of Hertfordshire. Until Barnet[c] and, later, Stevenage joined the Football League, Watford were Hertfordshire's only league club. Other nicknames have since been adopted, including The Golden Boys, Yellow Army and The 'Orns. Watford Rovers played at several grounds in the late 19th century, including Cassiobury Park, Vicarage Meadow and Market Street, Watford. In 1890, the team moved to a site on Cassio Road, and remained there for 32 years, before moving to Watford's current stadium at nearby Vicarage Road. The new stadium was initially owned by Benskins Brewery; the club rented the ground until 2001, when it purchased the freehold outright. However, the club's financial situation worsened following the purchase, and in 2002 Watford sold the ground for £6 million in a deal which entitled Watford to buy the stadium back for £7 million in future. Watford took up this option in 2004 using a campaign backed and funded by the fans called "Lets buy back the Vic". Vicarage Road is a four-sided ground with a capacity of 21,977. The East Stand, part of which was constructed in 1922, was closed to the general public in 2008 for health and safety reasons, although it still hosted the dressing rooms and the matchday press area. In November 2013, the East Stand was demolished and in its place a new steel-framed, 3,500-seater stand was constructed. The stand opened fully on Boxing Day 2014 and was named The Elton John Stand after the club's longstanding chairman. The Graham Taylor Stand (previously the Rous Stand), built in 1986, has two tiers and runs the length of the pitch, with the upper section containing the club's corporate hospitality. At either end of the pitch, The Vicarage Stand is split between the club's family section and away supporters, while the Rookery Stand is for home supporters only. Both stands were built in the 1990s, financed by proceeds from player sales. In the summer of 2015, The Elton John Stand was revamped in order to accommodate an extra 700 seats. This number was revised a day later to around 1,000 extra seats following the announcement of an expansion in the north-east corner. Between 1997 and early 2013, Watford shared Vicarage Road with rugby union side Saracens F.C. The stadium has hosted matches for the England under-21s, and senior international football between overseas teams. Elton John has also used Vicarage Road as a venue for concerts: He first played at the stadium in 1974 and returned in 2005 and 2010 to stage fundraising concerts for the club. Former events include horse and carriage shows and greyhound racing. The Watford Training Ground is located on the University College London Union (UCLU) Shenley Sports grounds in St Albans, Hertfordshire. Watford fans maintain a rivalry with those of Luton Town. The two sides met regularly in the Southern League between 1900 and 1920, and continued to do so in The Football League until 1937, when Luton gained promotion from Division Three South. Luton remained in a higher division than Watford until 1963. Throughout the 1960s and 1970s, Watford and Luton met sporadically. Despite this, the rivalry grew in significance, particularly following an ill-tempered match between the sides in 1969, in which three players were sent off. Both sides won promotion to the First Division in the 1981–82 season, with Luton taking the championship ahead of Watford. They were also relegated together from the new Division 1 in 1995–96, with Watford finishing 23rd ahead of bottom-placed Luton. 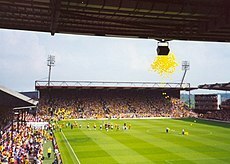 [b] Watford's promotion from Division 2 in 1997–98 meant that the two sides did not meet again until Luton won promotion to the Championship for the 2005–06 season. [b] The only meeting between those seasons – a League Cup tie in the 2002–03 season – was marred by violence inside Vicarage Road. On 2 January 2006, Watford won 2–1 at Kenilworth Road in the Championship. 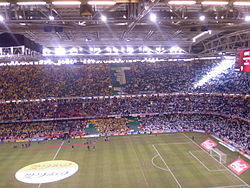 A 1–1 draw in the most recent match between the sides, on 9 April 2006, secured Watford's place in the 2006 Championship play-offs, from which they eventually won promotion to the Premier League for the second time beating, Leeds United 3–0 at the Millennium Stadium in Cardiff. Watford have played in a higher division than Luton in every season since 2006–07, a twelve-season span. The head-to-head record between the clubs in competitions which currently exist stands at Luton 39 wins, Watford 27 wins, with 23 draws. [d] Watford have remained the higher ranked team at the end of every season since 1997 (and for 28 of the last 29 seasons, with only 1996–97 seeing Luton finish higher in the league than Watford). 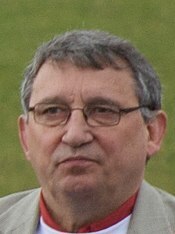 Graham Taylor took Watford from the Fourth Division to the First, between 1977 and 1982. Watford's team was selected by committee until 1903, when former England international John Goodall was appointed player-manager. The impact was immediate, as Watford secured promotion to the Southern League First Division in 1903–04. Goodall retired as a player in 1907, and left the club in 1910. He was replaced by his former captain, Harry Kent, who become known for his financial management of the club; under Kent, Watford frequently made a profit in the transfer market. Kent led the club to the Southern League title in 1914–15, and missed out on a second title in 1919–20 on goal average, before resigning in 1926. His three immediate successors – Fred Pagnam, Neil McBain and Bill Findlay – all played for Watford before and during the early part of their managerial tenures. None were able to lead the team to promotion from the Third Division South, although Findlay did lead Watford to a Third Division South Cup win in 1937. Up until Findlay's departure in 1947, Watford had been managed by five managers in 44 years, all of whom played for the team. By contrast, six men managed the club between 1947 and 1956, only two of whom were former Watford players. After a further three years under McBain between 1956 and 1959, Watford's following three managers presided over improved teams. Ron Burgess led Watford to promotion from the Fourth Division in 1959–60. Bill McGarry was only in charge for one full season (1963–64), but Watford recorded a finish of third in the Third Division, the club's highest Football League finish until that point. His successor Ken Furphy matched that achievement in 1966–67, and led Watford to the Third Division title in 1969, before taking the club to its first FA Cup semi-final in 1970. Following Furphy's departure in 1971, Watford entered a period of decline, experiencing relegation under subsequent managers George Kirby and Mike Keen. Graham Taylor took charge of Watford in 1977. He led the club to promotion to the Third Division in 1978, the Second Division in 1979, and the First Division for the first time in Watford's history in 1982. After a second-placed finish in the First Division in 1983, Watford competed in European competition for the first time in 1983–84, as well as reaching the 1984 FA Cup final. Taylor left the club at the end of 1986–87. Under the six subsequent permanent managers (Dave Bassett, Steve Harrison, Colin Lee, Steve Perryman, Glenn Roeder and Kenny Jackett), Watford slid from 9th in the top tier in 1987, to 13th in the third tier in 1997. Taylor returned as manager for the start of the 1997–98 season. He led the club to consecutive promotions, but could not prevent relegation from the Premier League in 1999–2000. Since Taylor's retirement in 2001, Watford have had twelve managers. Of these, Aidy Boothroyd took Watford back to the Premier League in 2006, but Watford were relegated in 2007, and Boothroyd departed in 2008. Following Watford's takeover by the Pozzo family, Gianfranco Zola was appointed head coach, replacing former centre back Sean Dyche in July 2012,. Zola took Watford to third position in the Championship in 2012–13 but resigned on 16 December 2013. He was replaced by fellow Italian Beppe Sannino in December 2013. Sannino guided the team to a final league position of 13th. Despite winning four of the first five league matches of the 2014/15 season, and with Watford sitting in 2nd place, Sannino's position had become the subject of much speculation following rumours of dressing-room unrest and some players taking a dislike to his style of management. Sannino resigned from his position as head coach on 31 August 2014 after just over eight months in charge. His final game in charge was a 4–2 win at home to Huddersfield Town the day before. Sannino's departure initiated a bizarre sequence of events which led to Watford having three further head coaches in little more than a month. On 2 September, Watford confirmed the appointment of former Brighton & Hove Albion head coach Óscar García as the successor to Sannino, beating off competition from fellow Championship side Leeds United for his services. García, however, resigned from his position on 29 September 2014 for health reasons, having been admitted to hospital with chest pains a couple of weeks prior. Billy McKinlay, who had only been appointed first team coach on 26 September 2014, was appointed as his immediate successor on the same day – his first position in management. A week later, McKinlay was released by mutual consent and former Partizan coach Slaviša Jokanović appointed in his place, apparently because the club favoured a head coach with greater experience. On 4 June 2015, Quique Sánchez Flores was announced as the new head coach as the replacement to Jokanović, who had failed to agree contract terms. Despite going on to lead the newly promoted Watford to a comfortable mid-table position in the Premier League and the semi-final of the FA Cup, it was announced on 13 May 2016 that Sánchez Flores would be leaving the club at the end of the season. Following Sanchez Flores's departure, Walter Mazzarri was announced as Watford's head coach starting on 1 July 2016. Mazzari's tenure as manager was terminated at the end of the season. On 27 May 2017 Marco Silva was appointed Head Coach. On 21 January 2018, Javi Gracia was appointed as Head Coach following Silva's departure. For a complete record of the club's achievements, see List of Watford F.C. seasons. Victory in the 2006 Football League Championship play-off Final against Leeds United gained Watford promotion to the Premier League. Striker Luther Blissett holds the record for Watford appearances, having played 503 matches in all competitions between 1976 and 1992, and his 415 appearances in The Football League during the same period is also a club record. Blissett holds the corresponding goalscoring records, with 186 career Watford goals, 148 of which were in the league. The records for the most league goals in a season is held by Cliff Holton, having scored 42 goals in the 1959–60 season. The highest number of goals scored by a player in a single game at a professional level is the six registered by Harry Barton against Wycombe Wanderers in September 1903. Watford's biggest ever competitive win came in 1900, when the team defeated Maidenhead 11–0 in the Southern League Second Division. The team's biggest Football League winning margin is 8–0; this first occurred in a Third Division South match against Newport County in 1924, and was repeated in a First Division match against Sunderland in 1982. Both of these matches were at home – Watford have won an away league match by five goals on six occasions, most recently in the 6–1 win against Leeds United at Elland Road in 2012. The most goals scored in a Football League game involving Watford is 11, in Watford's 7–4 victories against Swindon Town, Torquay United and Burnley in 1934, 1937 and 2003 respectively. The club's highest home attendance is 34,099, for a fourth round FA Cup match against Manchester United on 3 February 1969. The record home league attendance is 27,968 against Queens Park Rangers in August of the same year. Watford's home capacity has since been reduced due to all-seater requirements; it currently stands at 21,577. ^ The third division was renamed Division 2 upon the inception of the Premier League in 1992–93. ^ a b c The second division was renamed Division 1 upon the inception of the Premier League in 1992–93, and rebranded as the Football League Championship in 2004–05. ^ Although now located in Greater London, Barnet continue to participate in the Herts Senior Cup, organised by the Hertfordshire Football Association. ^ This refers to games played in The Football League, FA Cup and Football League Cup. Soccerbase covers matches played in these competitions since Watford joined the Football League in 1920 – the record in these matches is Luton 35 wins, Watford 27 wins, 22 draws. The teams met five times in the FA Cup prior to the 1920–21 season: Luton won 4 games, and the other was drawn. Birnie, Lionel (2012). Tales from the Vicarage, volume one. Peloton Publishing. ISBN 978-0-9567814-2-0. Birnie, Lionel (2011). The 100 Greatest Watford Wins. Peloton Publishing. ISBN 978-0-9567814-1-3. Birnie, Lionel (2010). Enjoy the Game – Watford FC, The Story of the Eighties. Peloton Publishing. ISBN 978-0-9567814-0-6. Birnie, Lionel & Cozzi, Alan (2001). Four Seasons – Watford FC 1997–2001. lionelbirnie.com. ISBN 0-9541757-0-0. Phillips, Oliver (2001). The Golden Boys: A Study of Watford's Cult Heroes. Alpine Press Ltd. ISBN 0-9528631-6-2. Jones, Trefor (1998). Watford Season by Season. T.G. Jones. ISBN 0-9527458-1-X. Jones, Trefor (1996). Watford Football Club Illustrated Who's Who. T.G. Jones. ISBN 0-9527458-0-1. Phillips, Oliver (1991). The Official Centenary History of Watford FC 1881–1991. Watford Football Club. ISBN 0-9509601-6-0. ^ a b "Udinese's Pozzo family complete Watford takeover". BBC Sport. 29 June 2012. Retrieved 14 July 2012. ^ "Official | Gracia Named Hornets' Head Coach". watfordfc.com. Retrieved 29 August 2018. ^ "History of Watford FC – Grounds". Watford Football Club. 9 September 2009. Archived from the original on 5 October 2009. Retrieved 27 October 2009. ^ a b c d "Watford – Historical football kits". Retrieved 17 October 2009. ^ a b c "Classic Cup Finals: 1984". The Football Association. Retrieved 27 October 2009. ^ a b c Hodgson, Guy (17 December 1999). "How consistency and caution made Arsenal England's greatest team of the 20th century". The Independent. Retrieved 21 April 2012. ^ Whitbread, Joe (30 November 2011) "Boothroyd takes over at Cobblers". Watford Observer. Retrieved 21 April 2012. ^ "Watford promoted to Premier League". BBC Sport. 25 April 2015. Retrieved 26 April 2015. ^ "Watford owner Gino Pozzo to sell Granada to Chinese firm Link International Sports". Watford Observer. 25 May 2016. ^ "Elton John quits Watford FC role". Watford Observer. 6 November 2008. ^ "The Rivalry". The Straw Plaiters. Retrieved 22 November 2018. ^ "They shaped the club". Watford Football Club. 29 May 2008. Archived from the original on 3 December 2008. Retrieved 27 October 2009. ^ a b c Jones 1996, p. 15. ^ a b c Jones 1996, pp. 8–9. ^ a b c d e f Jones 1996, pp. 267–274. ^ Jones 1996, p. 267. ^ Titford, Roger (July 2006). "Fifth amendment" Archived 19 May 2012 at the Wayback Machine. When Saturday Comes. Retrieved 19 April 2012. ^ Inglis, Simon (1988). League Football and the Men Who Made It. Willow Books. p. 132. ISBN 0-00-218242-4. ^ Brown, Tony. "English Division Three South Cup : Honours" Archived 4 December 2008 at the Wayback Machine. Statto.com. Retrieved 19 April 2012. ^ Twdell, Dave (2001). Denied F.C. : The Football League Election Struggles. Yore Publications. p. 18. ISBN 978-1-874427-98-8. ^ Ross, James M. (15 July 2011) "English league leading goalscorers". Rec.Sport.Soccer Statistics Foundation. Retrieved 19 April 2012. ^ a b c d e "Watford FC club records". Watford Football Club. 15 December 2008. Retrieved 18 April 2012. Archived from the original Archived 22 July 2012 at the Wayback Machine on 18 July 2011. ^ Jones 1996, p. 123. ^ a b Jones 1996, pp. 147, 151, 205, 272–273. ^ "Pat Jennings". 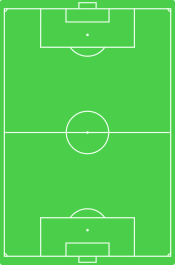 Irish Football Association. Retrieved 27 October 2009. ^ Jones 1996, p. 43. ^ Jones 1996, p. 80. ^ Brown, Tony. "Watford 1969–1970: results" Archived 27 July 2014 at the Wayback Machine. Statto.com. Retrieved 4 May 2012. ^ Brown, Tony. "Watford history 1945 to 1975" Archived 30 December 2009 at the Wayback Machine. Statto.com. Retrieved 19 April 2012. ^ Phillips, Oliver (21 January 2002). "Bitter times give way at last". Watford Observer. Retrieved 20 April 2012. ^ a b c d e "Graham Taylor profile". BBC Sport. 5 February 2002. Retrieved 27 October 2009. ^ Brown, Tony. "English Division Four (old) 1977–1978 : Table Archived 28 July 2016 at the Wayback Machine. Statto.com. Retrieved 19 April 2012. ^ a b Brown, Tony. "English Division Two (old) 1981–1982 : Table" Archived 9 April 2017 at the Wayback Machine. Statto.com. Retrieved 19 April 2012. ^ Brown, Tony. "Watford 1975–1976 : English Division Four (old) Table" Archived 24 September 2015 at the Wayback Machine. Statto.com. Retrieved 19 April 2012. ^ Brown, Tony. "Watford 1982–1983 English Division One (old): Table on 11.09.1982." Archived 24 September 2015 at the Wayback Machine. Statto.com. Retrieved 2 May 2012. ^ "Star striker Blissett heads for new life at Italy's AC Milan". Watford Observer. 6 July 1983. Retrieved 27 October 2009. ^ "FA Youth Cup winners". The Football Association. Retrieved 22 October 2009. ^ Titford, Roger (July 2009). "Joy divisions" Archived 20 May 2012 at the Wayback Machine. When Saturday Comes. Retrieved 2 May 2012. ^ a b c d e f Brown, Tony. "Watford history 1975 to date" Archived 16 April 2011 at the Wayback Machine. Statto.com. Retrieved 19 April 2012. ^ Johnson, William (1 May 2001). "Vialli unveiled as new Watford manager". Daily Telegraph. Retrieved 27 October 2009. ^ Hughes, Matt (14 June 2002). "Vialli sacked by Watford". Evening Standard. Retrieved 2 May 2012. ^ "Vialli sacked". BBC Sport. 14 June 2002. Retrieved 27 October 2009. ^ "Watford appoint Lewington". The Telegraph. 11 July 2002. Retrieved 2 May 2012. ^ "Watford in financial peril". BBC Sport. 24 September 2002. Retrieved 27 October 2009. ^ "Vialli sues Watford". BBC Sport. 7 February 2003. Retrieved 7 February 2011. ^ "Hornets eye stadium repurchase". BBC Sport. 13 March 2003. Retrieved 27 October 2009. ^ "Watford players agree pay cut". BBC Sport. 25 September 2002. Retrieved 27 October 2009. ^ "Watford dismiss manager Lewington". BBC Sport. 22 March 2005. Retrieved 24 April 2012. ^ a b "Boothroyd leaves Watford position". BBC Sport. 3 November 2008. Retrieved 27 October 2009. ^ a b "Leeds 0–3 Watford". BBC Sport. 21 May 2006. Retrieved 24 April 2012. ^ "Young completes £9.65m Villa move". BBC Sport. 23 January 2007. Retrieved 27 October 2009. ^ McNulty, Phil (14 April 2007). "Watford 1–4 Man Utd". BBC Sport. Retrieved 2 May 2012. ^ "Watford sign Ellington for £3.25m". BBC Sport. 29 August 2007. Retrieved 27 October 2009. ^ McNulty, Phil (14 May 2008). "Hull 4–1 Watford (agg 6–1)". BBC Sport. Retrieved 24 April 2012. ^ "Rodgers confirmed as Reading boss". BBC Sport. 5 June 2009. Retrieved 24 April 2012. ^ "Mackay appointed Watford manager". BBC Sport. 15 June 2009. Retrieved 19 April 2012. ^ Parker, Ian (16 December 2009). "Watford on brink of administration". The Independent. Retrieved 19 April 2012. ^ a b "Watford manager history". Soccerbase. Centurycomm. Retrieved 10 March 2011. ^ "Cardiff City appoint Watford's Malky Mackay as manager". BBC Sport. 17 June 2011. Retrieved 17 June 2011. ^ Matthews, Anthony (6 July 2012). "Hornets terminate Dyche's contract". Watford Observer Retrieved 14 July 2012. ^ Short, Paul (8 July 2012). "Zola confirmed as Watford manager". The Independent. Retrieved 14 July 2012. ^ "Watford seal Premier League return as Brighton are put to the sword". The Guardian. London. 25 April 2015. Retrieved 28 April 2015. ^ "Bournemouth top and Derby denied". 2 May 2015. ^ "Hornets Travel To Everton on Opening Day". Watford FC. 17 June 2015. Retrieved 18 June 2015. ^ "Arsenal 1–2 Watford – BBC Sport". BBC Sport. 13 March 2016. Retrieved 18 March 2016. ^ Conn, David (21 September 2002). "New owners of Vicarage Road revealed as Watford wither". The Independent. Archived from the original on 25 January 2013. Retrieved 20 October 2009. Subscription required. ^ Moore, Glenn (19 April 2008). "Anyone's race: Top of the league". The Independent. Retrieved 9 May 2012. ^ "The history of Barnet FC – 1939 to the 1950s". Barnet Football Club. 15 June 2007. Retrieved 2 May 2012. Archived from the original Archived 11 March 2012 at the Wayback Machine on 16 April 2009. ^ Ronayne, James (13 April 2011). "Bees sting Boro in Senior Cup Final". The Comet. Retrieved 12 August 2012. ^ Murray, Scott (21 February 2001). "Whatever happened to Third Lanark?". The Guardian. Retrieved 27 May 2010. ^ Barlow, Matt (13 February 2009). "Golden boys set bar for Watford as Blissett and Barnes roll back into town". Mail Online. Retrieved 20 April 2012. ^ Wilson, Paul (15 April 2007). "Feisty Watford a credit to 'best league in the world'". The Guardian. Retrieved 20 April 2012. ^ Bagchi, Rob (4 December 2010). "Premier League clockwatch". The Guardian. Retrieved 21 April 2012. ^ "FA Cup fifth round as it happened". BBC Sport. Retrieved 12 August 2012. ^ https://www.watfordobserver.co.uk/sport/17578011.watford-change-z-cars-for-elton-johns-im-still-standing-as-vicarage-road-match-day-song/]. Retrieved April 17th, 2019. ^ Phillips, Oli (6 August 2004). "Watford seal Vicarage Road Deal". Watford Observer. Archived from the original on 22 August 2011. Retrieved 23 October 2009. ^ a b "Stadium Update: North-East Corner Transformation To Begin". Watford F.C. 9 June 2015. Retrieved 10 June 2015. ^ Affleck, Kevin (31 July 2008). "Watford forced to close East Stand". Watford Observer. Retrieved 18 April 2012. Archived from the original on 18 April 2012. ^ "VIDEO: Watch the construction of the Sir Elton John Stand". Watford Observer. ^ "BBC Sport – Ex-England boss Graham Taylor 'honoured' by Watford gesture". BBC Sport. ^ "The stadium". wfc.net. Retrieved 18 April 2012. ^ "The details are Petchey". Harrow Times. 7 May 2003. Retrieved 18 April 2012. Archived from the original on 18 April 2012. ^ "Stadium Update: Extra Sir Elton John Stand Capacity". Watford F.C. 7 June 2015. Retrieved 8 June 2015. ^ Smith, Frank (10 May 2011). "Saracens will be staying at Vicarage Road". Watford Observer. Retrieved 18 April 2012. ^ "Last game at Vicarage Road sees Saracens through to Heineken Cup quarters". Watford Observer. 20 January 2013. Archived from the original on 28 October 2014. ^ Hershman, Josh (1 September 2011). "England begin with six-goal victory". UEFA. Retrieved 18 April 2012. ^ Smith, Frank (13 October 2011). "Ghana friendly was a success". Watford Observer. Retrieved 18 April 2012. ^ Smith, Frank (4 June 2010). "Elton John gig to raise around £600,000 for players". Watford Observer. Retrieved 20 April 2012. ^ Mott, Sue (4 May 2001). "Taylor made for management". The Telegraph. Retrieved 21 April 2012. ^ Jones 1998, pp. 27–63. ^ a b "Head-to-head: Watford vs Luton". Soccerbase. Centurycomm. Retrieved 23 April 2012. ^ a b Harrison, David (March 2002). "Herts rule Beds" Archived 23 May 2012 at the Wayback Machine. When Saturday Comes. Retrieved 19 April 2012. ^ Brown, Tony. "English Division One 1995–1996: Table" Archived 14 October 2018 at the Wayback Machine. Statto.com. Retrieved 2 May 2012. ^ "Joint probe launched into trouble". BBC Sport. 11 September 2002. Retrieved 7 February 2011. ^ "Watford 1–1 Luton". BBC Sport. 9 April 2006. Retrieved 19 April 2012. ^ Brown, Tony. "Luton Town history 1975 to date" Archived 8 June 2012 at the Wayback Machine. Statto.com. Retrieved 19 April 2012. ^ "Watford's FA Cup history". Watford Football Club. Retrieved 23 April 2012. Archived from the original Archived 11 February 2010 at the Wayback Machine on 11 February 2010. ^ "First-team squad". Watford F.C. Retrieved 31 January 2018. ^ "2017/18 squad numbers". Watford F.C. 3 August 2017. Retrieved 9 August 2017. ^ Phillips 1991, pp. 38–41. ^ "Boothroyd & Watford part company". BBC Sport. 3 November 2008. Retrieved 14 July 2012. ^ "Bill McKinlay left bemused following his spell at Watford". Sky Sports. 4 November 2014. Retrieved 5 June 2018. ^ Burnton, Simon (14 May 2016). "Quique Sánchez Flores was no longer the answer to Watford's question". The Guardian. Retrieved 14 May 2016. ^ "OFFICIAL: Walter Mazzarri Appointed Head Coach At Watford". watfordfc.com. Retrieved 21 May 2016. ^ Brown, Tony. "Watford records". Statto.com. Retrieved 18 April 2012. ^ "Watford Football Club". The Football League. Archived from the original on 21 April 2012. Retrieved 18 April 2012. Wikimedia Commons has media related to Watford F.C..